PhoFilter by iFacies is the ultimate app for filter effects. PhoFilter is the app to own if you want a full array of customisable filters. You can use one of the pre-set filters, combine those filters and also adjust each individual filter. The amount of combinations that you can achieve are countless. 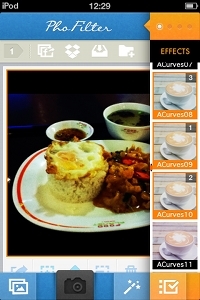 When you first open PhoFilter you will see the app populate the full range of filters which only takes under a minute. This is when you will witness the breathtaking amount and variation of filters that you will have at your disposal. Most photo filter apps have just pre-set filters with no customisation available, but this is not so with PhoFilter. If you choose to customise an individual filter, the customisation screen shows a slide bar adjuster, you can then adjust the filter to your desired look. Another way that you can create interesting variations is by selecting multiple filters. In the app you can even rearrange the order of the layers. There are a staggering 158 filters available which include effects, textures and themes. You can mix up to 12 filters at a time. Customised filters are also available for download or creation from Fan Filter, the app’s Facebook fan page. There is also the ability to share your filters with friends or the community via Fan Filter. PhoFilter allows you to share up to 30 pictures at once. I like the layout of the user interface, using split-screen display effects and graphical navigation buttons. It only took me a few minutes to find my way around the app and learn how to use it. Another thing that I like is that for every filter there is a corresponding thumbnail of a coffee cup, so that you can clearly see the effect that each filter will have. You can also customise the thumbnails that represent each filter. PhoFilter is a standalone app. The app gives you a good choice of social media sites to upload directly to and other sharing options. You have a choice of loading up a photo from your photo album or taking a picture by accessing the camera. This means that you don’t have to close the app down just to switch back and forth from the app to the camera. There is even a filter for adding a frame, date, text or your location to your photos. PhoFilter has so many filters and effects included you really won’t need another photo manipulation app. You can even adjust, resize and crop your photo from within the app. You can fully edit your photo from within PhoFilter, so everything is included to give you total control over your photo edits and effects. This app is complex in its range of functionality, but the developer has done a great job in making it simple to use with a nicely laid out interface. I really can’t fault this app, as there is so much choice as to the effects you want to achieve. I can only suggest a future enhancement in future updates. The only thing I can think of is to add more filters or effects, which is exactly what the developer is doing already, as more filters in updates are on the way. Great value for money, a powerful application, nice user interface, and an app which gives you a full filter toolkit to easily achieve the effect that you desire. If you like applying filter effects then this app will blow your mind!